many pieces were configured and hand assembled by our distiller. Selu (named for the Native American goddess of corn) is a 300 gallon combination mash tun/stripping still. Her distillation column includes a large copper bubble plate with copper coil cooling to reflux. 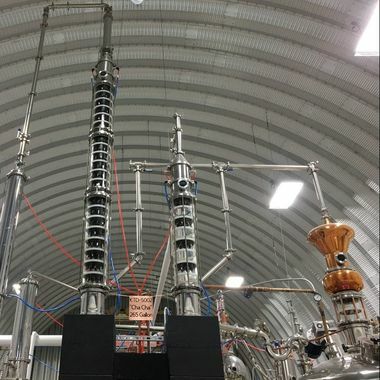 ​Cha Cha is a 260 gallon custom created reflux still for the production of our Vodka. She has 26 copper plates with 12 bubble caps per plate. Her total height is nearly 21 feet and she is 12 feet wide. 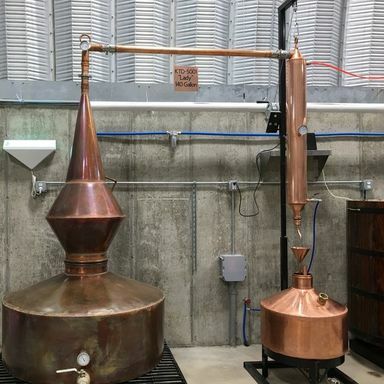 ​Lady is a traditional 140 gallon hand-made copper pot still with a unique "Missouri" shaped head. She delivers into a 30 gallon copper tolley. ​Cherry is a 150 gallon custom crafted gin only still. The design includes a unique attenuation ball that accommodates botanicals in the direct vapor path, as well as a large carter head to allow even more botanical options in the process.